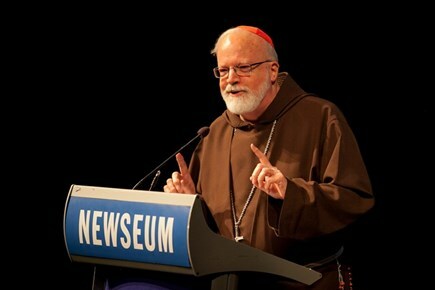 On September 9, 2014, His Eminence, Seán Cardinal O'Malley, Archbishop of Boston, delivered the Fall Lecture, entitled "Pope Francis and The New Evangelization," to a packed auditorium at The Newseum. To listen to a recording of the lecture, please click here. 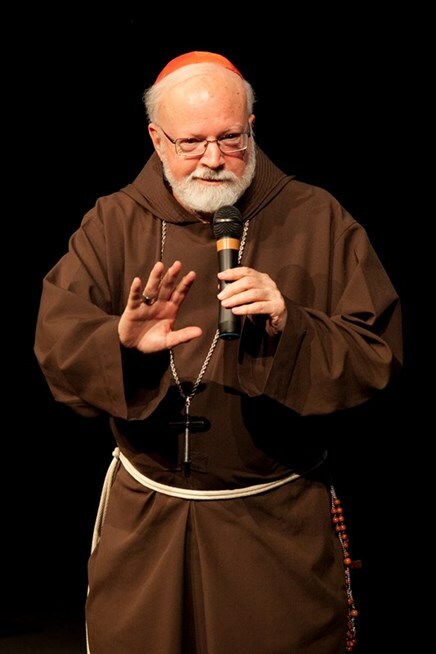 To learn more about Cardinal O'Malley and his service as the Archbishop of Boston, click here. Also, the Cardinal's blog can be accessed here. At the John Carroll Society Annual Dinner on April 26, attendees were welcomed with a video address from His Eminence, Donald Cardinal Wuerl. Cardinal Wuerl had recorded the address before leaving for Rome, where he was at the time of the Annual Dinner for the Papal Mass and canonizations of Pope John Paul II and Pope John XXIII. In his address, Cardinal Wuerl thanked the John Carroll Society for its continued service to the Archdiocese of Washington, which is celebrating its 75th anniversary this year. After Rose Mass, Cardinal Wuerl Thanks Carroll Society Volunteers for Reflecting "The Francis Effect"
Pope Francis’s style of sharing Christ’s love with the poor and sick – which has been characterized as “the Francis effect” in the pope’s first year – is a way of living and sharing the faith that members of the John Carroll Society in the Archdiocese of Washington have been demonstrating for many years, Cardinal Wuerl said March 30. Speaking after the annual Rose Mass at the Church of the Little Flower in Bethesda celebrated to pray for health workers, Washington’s archbishop thanked the John Carroll Society members for faithfully volunteering in Catholic Charities’ health care and legal networks serving the poor. “Francis doesn’t just tell us what the Gospel says – he shows us how to do it. Thank you for helping that resonate here in the archdiocese,” Cardinal Wuerl said at the Rose Mass brunch, where four lay volunteers with Catholic Charities Health Care Network, and a local priest serving as a hospital and nursing home chaplain, were honored. 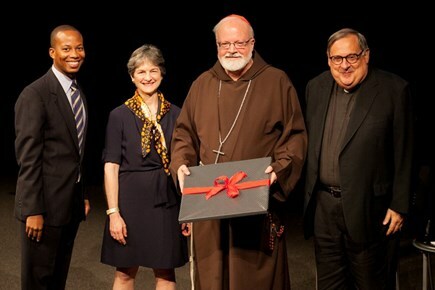 Cardinal Wuerl presented a special medallion commemorating Pope Francis’s first year to Elizabeth Meers, the society’s president; Dr. Thomas Winkler, the Rose Mass Committee chair; and to Msgr. Peter Vaghi, the society’s chaplain and the pastor of the Church of the Little Flower. The Rose Mass is celebrated annually to seek God’s blessings on the medical, dental, nursing and allied health care workers, and on the many health care institutions in the Archdiocese of Washington. Since 1992, the John Carroll Society has sponsored the Rose Mass in the Archdiocese of Washington on Laetare Sunday, the fourth Sunday of Lent, when the vestments worn by the celebrant are rose-colored. The rose also symbolizes life, whose care is entrusted to the healing professions. During the brunch following the Mass, the 2014 Pro Bono Health Care Awards were presented to Dr. Elizabeth Dugan, a dermatopathologist; Dr. Robert Murphy, an ophthalmologist and retina specialist; and to Dr. Joshua Yamamoto, a cardiologist. All volunteer with Catholic Charities’ Health Care Network, as does Dr. Salvatore Selvaggio, a dentist who received the 2014 James Cardinal Hickey Lifetime Service Award, named for the former archbishop of Washington who worked with a small group of doctors to found the Health Care Network in 1984. This past year, the 220 volunteer doctors, dentists and specialists in the network, along with participating hospitals and clinics, provided more than $6 million worth of charitable care to 1,915 patients. Also at the Rose Mass brunch, Father M. Valentine Keveny, the Catholic chaplain at Shady Grove Adventist Hospital in Rockville and Asbury Methodist Village in Gaithersburg, received the 2014 Msgr. Harry A. Echle Award for Outstanding Service in Health Care Ministry, named for a priest who served as a longtime hospital chaplain in the archdiocese. 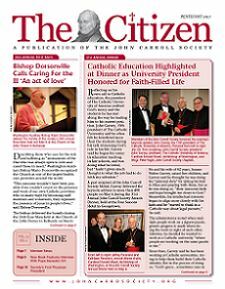 Read more about After Rose Mass, Cardinal Wuerl Thanks Carroll Society Volunteers for Reflecting "The Francis Effect"